Okay, so dry fly season is about to be in full-swing as water temps hit the sweet spot. But I can rarely resist the temptation of stripping big tricked out streamers, looking for a toad to get up off the couch and eat. One of my favorites for browns, brookies and bronzebacks are wool head sculpins. I tie these in a few colors including brown, olive, and yellow. The brown and olive are definitely more natural, but yellow sometimes has near mythical abilities to excite fish, especially browns for whatever reason. I like the wool heads better than spun deer hair because it absorbs water and sinks quickly, yet it still pushes a bunch of water (which helps predatory fish detect it with their lateral line) while still giving the fat head profile of the natural. When the rabbit strip is wet it slims down and creates a realistic body profile. 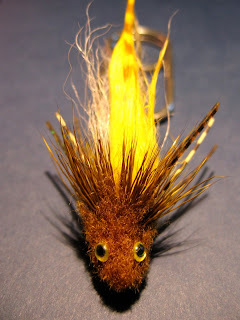 The deer hair collar and rubber legs add a little more motion and imitate the dramatically large pec fins of a sculpin. The other key is the that the rabbit strip wing is left unsecured in the back and has a white calf tail underwing. By leaving the rabbit strip untied in the back it allows more side to side motion as well as up and down. The multi-directional motion adds realism and gives multiple trigger points for strikes. The calf tail underwing helps to keep the rabbit wing "up" and reduces fouling around the hook bend. The marabou tail adds a little more movement while the pearl sparkle braid imitates the white belly of a natural. Finally, the eyeballs are superglued to the wool, on top of the head. Sculpins are bottom huggers and their eyes are set high. The fly is unweighted, so it is best fished on a sink-tip of even a full sink. Fishing full sinks in moving water is a little unconventional, but it works to get the fly down quickly, especially if fished from a boat when you are moving with the current. I like to pitch these into riffles and let them roll down into the bucket at the bottom of the riff. Another good bet is to sweep them along the banks into fishy looking lies. It seems like most strikes come when the fly is retrieved cross current, giving a side profile view to the fish. If you're worried about short strikes, forget about it. Big fish usually don't short strike. Big fish aim for the head to intercept their prey. The theory is that if trout (or bass) ate spiny backed fish like sculpins from behind, they would likely choke to death as the prey lodged in the throat. The eyes act as a target for predatory fish that move to intercept their prey head on. If you feel the bump, it's probably not a short strike, it is likely a fish hitting the fly with its body or tail to "stun" it so that it is more easily caught. I have seen more than one brown trout end up foul hooked in the shoulder on flies like these. It's easier for the fish to hit the fly with the mass of it's body than to intercept it with it's relatively small mouth. Once the prey is stunned, and on the dead drift, it's easy pickins'. If you feel the bump, STOP! Let the fly go on the dead drift because he might be circling back for the eat. One last tip, just because you might be fishing "traditional streamer" water, give sculpins a try. Brookies love them. 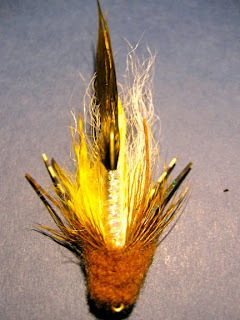 Remember, the muddler was originally tied to catch big Canadian brookies. Guess what... they work really well on big Maine brookies as well! Tie some up, and have fun. Now go see Selene at M-Flies in Brunswick and tell her Wild River Angler sent you!